Wait a minute! Did you hear that? Did you hear that strange sound tip-top-tapping at the window? There. It's done it again. Tipping and tapping as if the ghost of Sammy Davis Junior was dancing upon a sheet of glass. But then again, maybe my nerves are getting the better of me. So, it would be for the best if I direct your attentions to my mate Thom, plus his marvelously spooky comic book series. 1) What are your own origins, Thom? Plus what path did you take in life prior to getting to where you are today? I’m a freelance graphic designer / animator by trade based in Kent, Canterbury. After I left school I didn't fancy the debt and uncertainty of university, so I worked as a runner for a small ad agency in London where I was lucky enough to get training as a junior designer. From there I worked for a range of media agencies up in London and around the UK, before starting my own creative business, Captcha Studios, around 5 years ago. We handle everything from music videos, to boutique websites and magazines, so there’s never a dull day. 2) What inspired you to create, ‘Malevolents’? 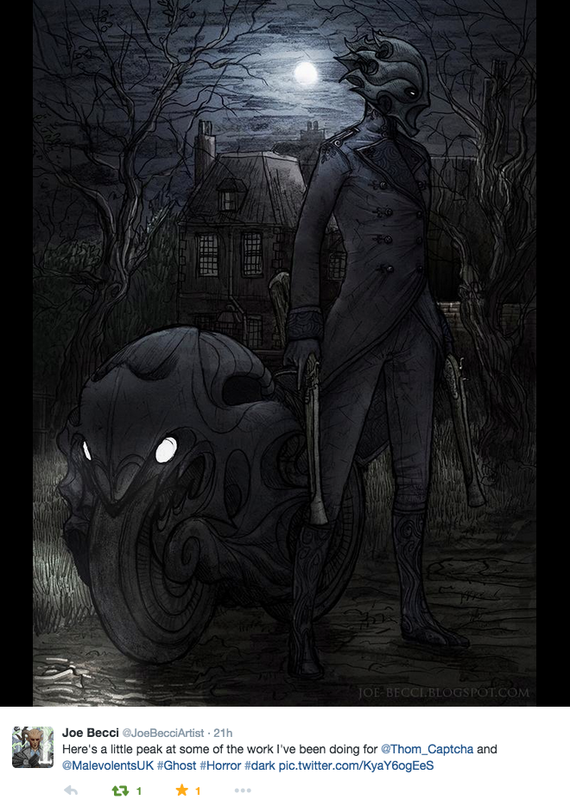 Malevolents came about from a much bigger graphic novel I've been working on for over 10 years now called ’Ghoster’ -- about a lineage of ghost assassins. I've always had an interest in the supernatural and I’d been messing around with a story whilst undertaking long winter commutes on the old creaky trains to London in the early noughts. As it’s been such a large and long, drawn-out project to work on, I realized as a first time comic book author it would be logical to get a feel for story-boarding a shorter comic and to test the waters of the concept with some sort of prequel. At the same time I’d also been playing around with an idea for a short series of supernatural horror comics set in the same universe. The concept was to keep it short and hopefully keep the reader unnerved as much as possible within the context of a comic. I was very lucky to meet Joe Becci, the talented artist who illustrated Malevolent, and I think his fantastically powerful drawings have really helped to bring the project alive. 3) Can you briefly tell us what this comic is all about? In short, the Malevolent series is all short supernatural horrors based on individual hauntings -- all set around real horrifying accounts but within comic book form. There’s three short stories, all individual tales. 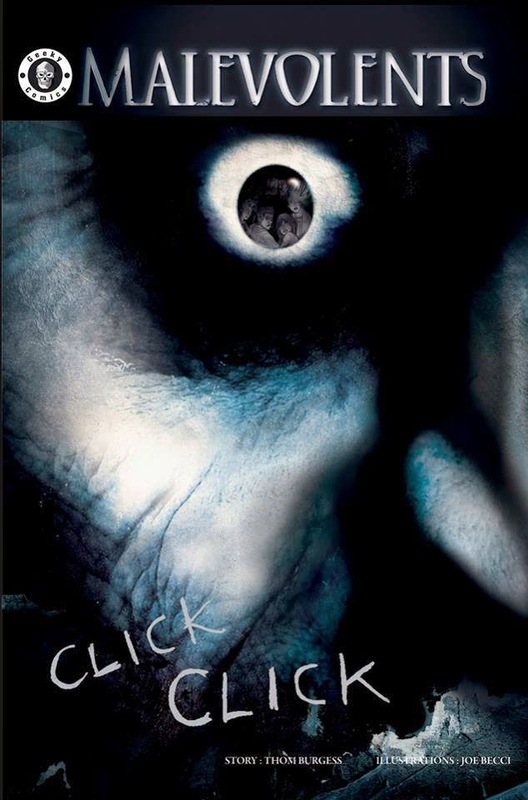 Book one ‘Click Click’ is on the old London haunting of Berkeley Square which is primarily a flashback set in the 90s. The story tells of four school friends who decide to spend the night in London’s most haunted house, and recount the story of the last boy who dared to do so... and his supposed fate. 4) What song would you say best represents your story and why? What an interesting question! All of Ghoster and Malevolents has had a huge musical relevance. There’s actually a 90s playlist to accompany book one on youtube. I've always thought having an extra dimension to a story is really important to flesh it out. Not to mention the fact that the main character is haunted in his father’s own record shop. Something which was actually based around a ghostly real life experience of a friend of mine in Canterbury. But I find by far the most emotive artist who’s helped conjure together the world has to be the group Hybrid Sound System. I've long been a fan and their work has a fantastic epic, otherworldly feel. There’s too many of their songs to list as inspirations -- but there exists a full Malevolents trailer of the comic series, which is set to their amazing ‘soundtrack’ score of ‘Empire’ -- which I think perfectly conjures the unease of Malevolents. Hopefully if they like the comic then the full trailer will get a proper release one day on youtube. 5) If you could get a celebrity – either living or dead – to promote your wares, who would you choose, and why would you want to choose this particular person? That’s particularly hard. I couldn't stick with just one! I’m a huge fan of Mark Gattis’ work. I really enjoyed his history of horror series and I loved his documentary on M R James, ‘Ghostwriter’, and his supernatural series, ‘Crooked House’. I think he really ‘gets’ the appeal of a good supernatural tale. Along with which I’m also a big fan of Charlie Brooker, and his just incredible 'Black Mirror' series. They’re always so ‘dark’ but brilliantly emotive. I think as writers and directors they both have great ideas about how to ‘chill’ people -- in two totally different ways. Something which is definitely amiss in general with a lot of horror on our TV -- both supernatural and technology based. 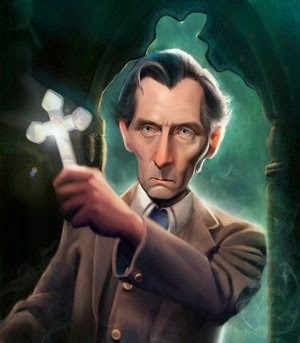 Oh, and as for deceased, it would have to be Dr Frankenstein himself, Peter Cushing. I’m a Whitstable boy and I've vague memories of seeing him on his bike when I was young. He also always comes across as a gentlemen and thoroughly nice guy in all his interviews and I loved all his Hammer Horror Work. 6) What have you learnt about yourself through this endeavour? And were their any unforeseen obstacles you had to contend with along the way? It’s been a great learning curve. I've had fun working through countless content trying to ascertain what really ‘unnerves’ and builds tension -- right from delving into childhood nightmare fodder, and then attempting to translate that into a comic. Undoubtedly working to a limited number of pages was tricky, also it was always going to be a challenge to create ‘Maggs’ the ghost of the piece as he’s such an embodiment of wickedness. But I've been hugely honored working with Joe who made the whole process as painless as possible -- and created something striking in the process. 7) During your time in this field, what is the one thing that has kept you in good stead? Undoubtedly it’s been from getting kindly feedback from the likes of Andy Nyman, who wrote the utterly fantastic and terrifying 'Ghost Stories The Show', Stephen Volk (Ghostwatch), and most recently director Carl Tibbetts who directed the astoundingly good, 'Black Mirror: White Bear and White Christmas'. All of whom I have immense amount of respect for and who’s work have all unnerved me greatly! But just hearing from people who've read it and genuinely enjoyed it has been really great to hear -- and a definite motivation for finishing book 2. Which is (nearly) story-boarded! 8) If ‘Malevolents’ had a motto, what would it be? 'Something wicked, is already here'. 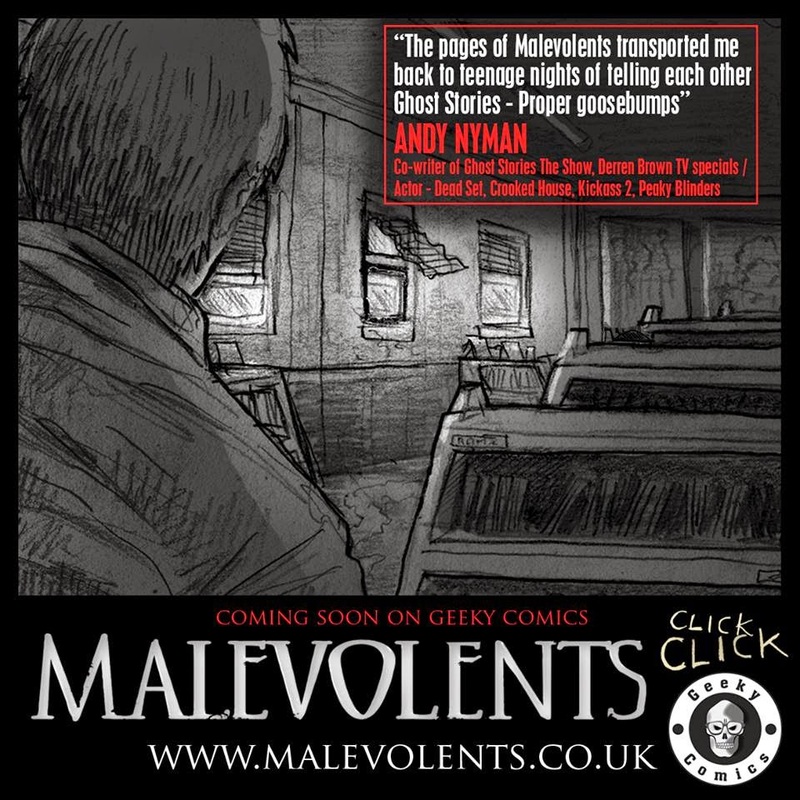 And on that sinister note, dear reader, I'd like to thank Thom for telling us about his comic book, 'Malevolents', before directing you towards his twitter, facebook, and tumblr pages.